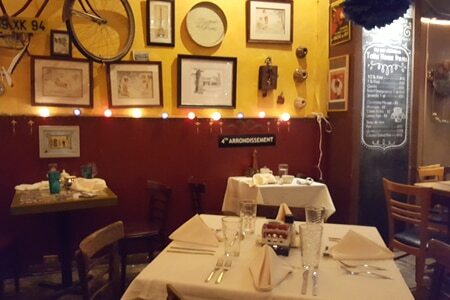 Cozy neighborhood bistro specializing in the cuisine of Alsace, France. : This popular, charming French bistro was a pioneer in Decatur’s evolution as a dining destination. Owner Benedicte Cooper, from Alsace, France, opened it in 1997. The menu offers such delights as house-made liver pâté and on weekends a special rabbit pâté with pistachios. But you'll also find the rarely seen German-influenced Alsace cooking, such as spätzle in three versions; standout onion pie; and choucroute garnie (in cool weather) brimming with sausage and sauerkraut studded with juniper berries. However, flamenkuche, a flatbread topped with sautéed onions and cheese, is the star of that lineup. At lunch classic Alsace sandwiches, Mauricettes, are made with traditional pretzel bread, and there’s quiche Lorraine. Rib-sticking cassoulet appears in winter and the soups vary with the seasons, although French onion is available year-round. Rich chocolate mousse headlines the desserts, but homemade ice creams, crème brûlée and fresh fruit tarts tempt, too. French wines, which include Alsace offerings, compose the short but very worthwhile list. Among the few beers are an Alsace selection as well as German and Belgian. Brunch is well executed, with stuffed savory crêpes, for instance.